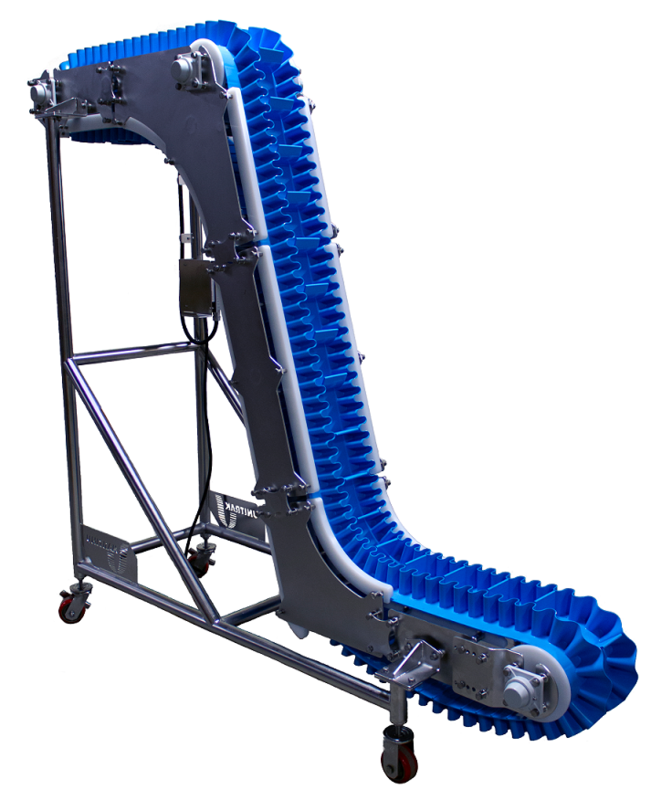 The KleanTrak conveyor from UniTrak is a cleated belt conveyor specifically engineered to overcome the challenges of sanitary conveying. These conveyors are designed to allow easy cleaning in food, pharmaceutical, and other washdown environments. KleanTrak features a sanitary design that minimizes the opportunity for bacteria growth. They use a cleated FDA-approved belt in a patented tensionless drive system that provides no belt slippage or stretch. Frames are made from 304 stainless steel and a variety of finishes are available, including electropolishing. The conveyors are equipped with a washdown duty drive motor and corrosion resistant bearings. Conveyors can elevate from 15° to 90°, and available options included a stationary or mobile/portable base.